New 11.5" size is our longest water stone. The length is a huge advantage when sharpening larger knives and tools. Our drive to provide the newest and best sharpening materials available is relentless. We are committed to researching and bringing superior products to our customers. In our searches, we have noticed that there are not many options for water stones made in America. Until now. 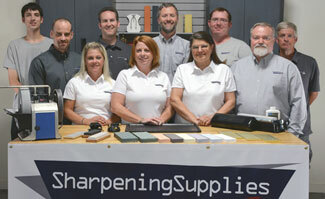 We are proud to introduce the Sharpening Supplies Water Stones, developed and manufactured right here in the US. These are well balanced stones. They emphasize fast cutting action, some of the fastest we have seen. Yet they also keep their shape well, not requiring excessive resurfacing. While the combination of fast cutting and hard wearing sounds pretty straight forward, it's actually a trick to pull off. With sharpening stones, there is a delicate balance between speed of cutting and ability to hold flatness. The two features don’t always go hand-in-hand. Often, stones are fast precisely because they break down quickly and expose fresh grit when used. Stones that don't break down as quickly on the other hand sacrifice some speed of cutting for the benefit of holding their shape longer. We're very pleased with how our Water Stones balance the two attributes. 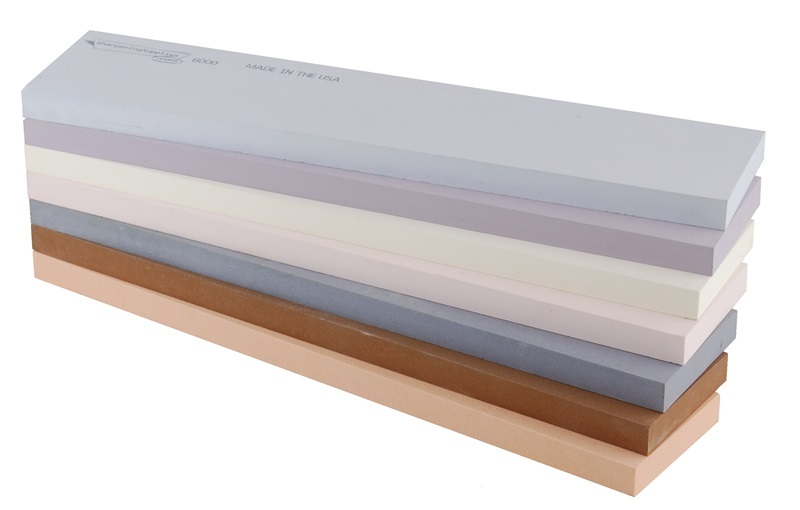 Sharpening Supplies Water Stones are constructed with a vitrified bond rather than a resin bond. We find that gives them a responsive feel in use. You can feel the cutting action while using these stones. They feel firm, not muddy or soft like some other water stones can. They are a soaking stone, and do need to be placed in water for 10-20 minutes until saturated before use. However, unlike other stones that discourage storage in water, the bond of Sharpening Supplies Water Stones will not degrade with long term water contact. We made certain that they covered a wide range of grits. As such, we offer them from an aggressive 220 right up to a polishing 8000 at well-spaced intervals. The available grits are: 220, 400, 600, 800, 1000, 3000, and 6000. It's unlikely that you will need every stone in that range, but rest assured you can find a complete set, whatever your needs may be. These stones measure 11 1/2" x 2 1/2" x 1/2". This extremely long water stone will sharpen the largest knives and tools. Once you've used a water stone this large, you'll never go back to a shorter stone. These stones are packaged in basic industrial packaging. This allowed us to keep the price low. It will be securely wrapped in bubble during shipment to avoid damage. This is not the least important point. We believe in sourcing American-made products whenever possible, so we're proud to say that our Water Stones are made right here in the USA. Q. Do Sharpening Supplies Water Stones need to be flattened? A. Yes. While they wear well as water stones go, Sharpening Supplies Water Stones will need to be flattened periodically. We suggest our Double-Time Flattening Stone for the job. Q. Are these made the same as the other Sharpening Supplies Water Stones? A. Yes, they are made of the same materials, they are just a different size. Monday through Friday, 8 a.m. - 4:30 p.m. I want to thank you for your prompt, speedy attention to my order. The other day I received my order and was pleasantly surprised at how quick my order was processed and received. I will definitely purchase from you again should I need more or other sharpening supplies. Sign up for our Sharpening Newsletter! Copyright © 2006-2019 Wingra Direct LLC. All Rights Reserved.